Jamie Hewitt is the classic `local boy made good', the kid who signs for the club he supported as a boy and carves out a distinguished career with them. But for injury, managerial whim on the selection front and a brief sojourn at another club, he may well have overhauled Dave Blakey's appearance record: he stands as one of the club's most significant players, without that. Jamie had yet to sign pro forms when he made his debut at Plymouth, coming on as a substitute for Steve Spooner. Understandably nervous, he showed some promise, and was given a run in the side at the end of 1985-6. His full League debut came in a highly charged atmosphere, against Derby County. The Spireites won the match with a late Steve Baines goal, and Jamie kept the highly-rated Gary Micklewhite quiet for most of the game. Although usually played at right-back, much of his best early play came in a sweeper role. He began operating regularly in midfield in 1990, improving his heading and distribution, and, despite suffering awful criticism from the terraces, he came to be regarded as a fixture at Saltergate. His release in McMenemy's mass clearout in the summer of 1992 was met with surprise, then, and Doncaster moved quickly to snap him up. John Duncan brought Jamie back in October '93. He returned a better, more confident and more complete player. His reading of the game improved with experience and, as an experienced professional, his calm, unflappable play came to the fore during the club's run to the FA Cup semi-finals in 1997.Much is made of the romance of the Cup, and it was entirely in keeping with that trophy's fine traditions that Chesterfield's late, late extra-time equaliser in the Old Trafford game was scored by its long-serving, Chesterfield-born defender. 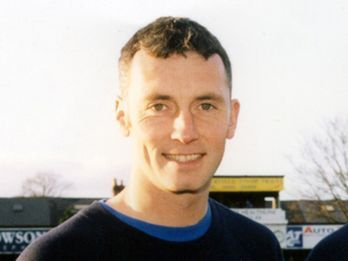 Jamie was granted a testimonial season in 1998-9 and retired after the 2001-2 season to become the club's physio, a position he holds to this day. Jamie’s uncle Ron played league football for Lincoln, and his father Leslie had a few games with the club’s “A” team in the late 1940s. The family tradition is maintained by Jamie’s son Alex, who joined Chesterfield’s trainee scheme in the summer of 2012. For Chesterfield: 488+18 Football League appearances; 26 goals.